The Kansas City Royals are heading to their first World Series since 1985, after beating the Baltimore Orioles 2-1. The Royals have now won eight straight games, and Ned Yost became the first manager to ever win his first eight postseason games. Kansas City has been able to win so many different ways this postseason from stealing bases, to hitting home runs, and their sensational defense it has been that perfect recipe for success. Their pitching has been lights out and their bullpen looks like the best in baseball. It was the first time that the Orioles had ever been swept in a postseason series, this was their 21 postseason. 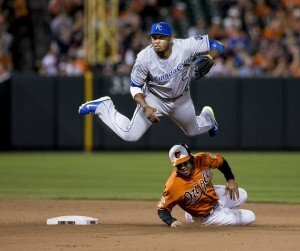 The Royals defense proved strong yet again for the Royals, and like usual this game featured another highlight reel catch from Alex Gordon. This game was all about pitching and defense, with all three runs in the game coming in the first three innings. Kansas City got on the board first in the first inning, when Eric Hosmer grounded into a fielder choice to first base and both runners on base scored on an error by catcher Caleb Joseph. The only run by Baltimore came on a solo home run by Ryan Flaherty in the third inning. Both teams scored doing what they know best, Baltimore hitting a home run and Kansas City just finding a way to score. Kansas City’s Jason Vargas was absolutely brilliant, pitching 5 1/3 innings giving up just two hits and that home run. The Royals bullpen was great yet again, giving up a combined two hits between Kelvin Herrera, Wade Davis, and closer Greg Holland. Holland was the lucky pitcher that was on the mound when the Royals won the game. Baltimore’s Miguel Gonzalez was great giving up just two runs (one earned) on four hits in 5 2/3 innings. The blame can’t go to Gonzalez because he gave the Orioles their best chance to win and the offense could never get anything going. The Baltimore bullpen only gave up one hit in 2 1/3 innings. The only player to finish the game with more than one hit, was Kansas City’s Alcides Escobar with two. I thought that this series was going to be a great one that came down to Game 7. I had the Royals winning, but I never would’ve never guessed they could sweep the Orioles. Kansas City is playing great baseball, but I’m concerned about them not playing for the next week. In the past teams have struggled after not playing for an extended period of time. Hopefully they can keep that desire and motivation for the next week and bring us a great World Series. This was a great season for the Orioles, it may not have ended the way they like, but they won their division and reached the ALCS. This was a successful season and they’ll be right back in contention next season. Baltimore will be back at full health next season, with Manny Machado, Matt Wieters, and Chris Davis. I do think that a veteran starter would come in handy, especially during the postseason and I think that is what Baltimore should set their eyes on this offseason. The Royals will play Game 1 of the World Series next Tuesday against either the San Francisco Giants or the St. Louis Cardinals. Can OKC win without Kevin Durant?